My first experience with AquaStretch™ was as a client. Debilitating back pain was eased in minutes. The real miracle was that I was able to quickly get back to work as a fitness instructor. Connie taught me how to use AquaStretch on myself to ease neck tension and headaches. To broaden my training as a fitness instructor and aspiring personal trainer, I joined an AquaStretch™ course with Connie. The entire course was conducted entirely in the pool, with immediate hands-on experience. Connie chose to spread the course over 4 weeks rather than all in one day, giving us the ability to absorb our new knowledge and practice our new skills. We had the opportunity to bring a person to practice on, in addition to the volunteers that also offered their insight as experienced recipients of AquaStretch™. At the end of our 4 weeks together, I was able to immediately put into practise what I learned with a client at work. My client was thrilled with the results of AquaStretch™! As a new facilitator this is very exciting. Connie, the results from my session of AquaStretch with you yesterday are nothing short of amazing. I was dubious until your magic touch relieved muscle tension I didn't realize was there until it was gone! Today I'm still riding an endorphen high, feeling like all my working parts have had a full lube job. Even my feet, after recent extensive foot surgery, feel so much better and less achy. I'll follow your suggestions for home and pool exercises to maintain this new-found comfort. THANK YOU, thank you, thank you for such a pleasurable experience and these wonderful results. An amazing course. I had so much stress the day before the course and I woke up completely free of stress after the course and experiencing all the aqua stretches we did in the pool. I'm looking forward to practicing and using in my daily life. Thanks Connie! It was so beneficial to have so much pool time and be able to practice. Being able to practice on the instructors was even better because we got very constructive feedback. Connie is a fabulous instructor. She explains things in "layman" terms so that us non PTs can understand. I totally understand "intuitive movement" so much better!! She used the analogy of how we stretch in the morning and how we move our bodies to stretch and "wake up". Bingo! I finally got it!! I thoroughly enjoyed myself and learned SO SO much. It was worth every $!" I wanted to send you a message about how GREAT I feel while it's fresh! I didn't even realize how good I felt until I got in the car. I can't believe how lose my neck and shoulders feel, it's really incredible. I can't wait to tell my physio. I have been so tight that I haven't even been able to do the exercises properly that she wants me to do. It was like my neck was on lockdown. Headache is gone and I feel probably 80% better, this is amazing. It's unreal how much pain I was walking around with, I'm SO happy I was able to get in the pool today! You have magic hands! Thanks a ton! The whole idea behind my words is to inspire others that have had the healing challenges that I have encountered; to know that they have a choice to try something that can heal their pain and give them back their love for life. 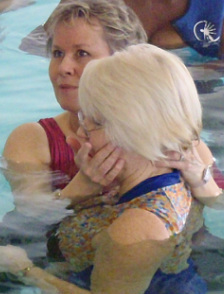 I have been working in a warm water pool with Connie for several months now, using aquatic exercises and AquaStretch™. The chronic pain and depression that I have suffered for more than 10 years has improved by 75%. I fully expect to regain 100% pain free mobility of the body working with Connie and the pool exercises. During the 10 years of chronic pain in the back and neck, I worked with dozens of professionals: physiotherapists, certified personal trainers, medical professionals, nutrionists, osteopaths, chiropractors and the list goes on. It wasn't until I was introduced to Connie that the true healing in the Body and Mind began. What did Connie possess that all the others did not? Her expertise in chronic pain education, relief and management made all the difference in the recovery of my body. The AquaStretch™ and warm water aquatic exercises transformed my health on all levels, but most importantly, Connie understood that no body could innately heal from pain unless the central nervous system was in a calm state. This was the critical difference in Connie's treatments from all other professionals that I had worked with. The journey began with Connie working with my body, to calm the central nervous system, and thus provide an environment for my body to heal the chronic pain. After several months of training the central nervous system to more easily achieve a calm, relaxed state, the body was ready for strength training. Connie and Jan helped me learn aquatic exercises to train the body back into a state of strength, while and at the same time, keeping the nervous system calm and relaxed. Connie's program has been life changing for me, and everything in my world has improved. Deepest gratitude to Connie, Jan and all of the supportive friends that I have connected with in St Luke's pool. I had my hip replacement surgery Jan 21, 2013, at that time my leg was also lengthened 1/2". That does not sound like much but to muscles and nerves it is!!! After 17 months the muscles and nerves have lengthened but I was still getting a lot of pain and could not climb stairs, walk or move properly. Then I was introduced to Connie and within 4 sessions I was able to walk, climb stairs and function like I did 10 years ago when my hip problems started. I would recommend AquaStretch™ to everyone who needs help with pain management or just needs help getting muscles moving that have not moved in a longtime. Connie was very patient and really seemed to understand the problems I was having, answered all my questions and helped me help myself when any pain started at home or work. I am now basically pain free and able to participate in all the activities I have avoided for many years!!! This 14 minute video shows in detail the use of AquaStretch™ to restore shoulder girdle and shoulder joint movement and comfort. Stay tuned for more information from Jaye about how AquaStretch™ has affected her shoulders. I would like to encourage any one suffering with back problems to come work with Connie. I have a reoccurring black injury since I an had an accident at work while a nurse. I fell with a very tall client and broke the facet joint bilaterally as well as developed a bulging disk both at L 4/5and S1 joints. As happened in this case, I suffer from early onset osteoarthritis . I have spent a long time trying to get help with this. This past Sunday I went with a back that was just crippling. Within two minutes and Connie's amazing AquaStretch™ techniques, I was able to get relief that was just unbelievable. After about 15min. I felt like a human being again. I was able to walk without limping, move without immense pain and along with instructions, able to help myself. I attend these sessions as often as possible and always come out of the pool feeling relaxed, less tense and at one with the chronic pain. A life long believer in Aqua Fit. I've have experienced AquaSretch™ sessions with Connie for over 2 years for different reasons. I have a predisposition to low back and hip pain, plus an injury that happened two years ago. AquaStretch™ has always helped me to rebalance my body and get rid of pain. Last week was amazing! For some reason, my lower back was "stuck" to the point that I couldn't move because it was hurting so much. I couldn't sleep. I felt it unlock while Connie worked on me. The following day, I was free of pain! With this back pain issue, it took only one session to solve my issues. I have witnessed many people coming to the pool for repetitive treatments, due to injuries or chronic pain. Some people are on strong medications. Connie helps increase their autonomy with AquaStretch™ and all the education she gives to people about pain management. Because of this, some people are able to reduce their consumption of pain killers. Thank you Connie for your generosity in this mission of helping people to have a better health and life, you're doing a fantastic job. Connie, THANKS for the wonderful AS session today. I am enjoying my stretched, mobile body. Today's session not only freed up my body, it also reinforced the basic concepts from Monday's AquaStretch™ Foundations training and taught me how a session should feel from a client's perspective. Thanks for your patience and explanations. See you next year! Thank you so much Connie for the AquaStretch session yesterday. I have had extensive pain for many years. One session was all I needed to be pain free for over a day. I felt so good after the second session that I thought I could take on the world.....the garage...... a big job that has been waiting for months! I could only work for an hour or so and found I was totally exhausted and had a nap. After the nap, there was in a little pain but not as much as usual. This morning I am on top of the world.....no pain and I slept all night. I have noticed the restful sleep that results from a session. I can hardly believe how good my body feels. I remain mostly pain free today. When I got up, I was no where near as stiff as I usually am. I haven't felt this well in a long time. Thanks Connie....I am so grateful. You sure do have a 'magic' touch and I look forward to more sessions with you. I have / had a little problem with my IT bands left side because when we spar in karate the left side does most of the kicking. The right side was compensating so both sides were unhappy. I was having a little trouble walking comfortably (not good for sparring) when Connie went to work. Oh My God does it feel better! I was too relaxed to go to karate last night and I wanted to remain pain free. Slept, lights out last night, deeply and long. Thank you for working your magic! This is Marion's excited message today after 20 minutes of AquaStretch. "I'm so excited I just had to let you know right away (right after our AquaStretch session) ... I changed clothes, hung out my swim stuff, took 1 Tylenol and sat down for a half hour to read and relax. When I got up I had NO PAIN ANYWHERE! I went upstairs to do a few things for the kids (after school snack, etc.) and fiddled around in the kitchen for 15-20 min. and have just come back downstairs...still NO pain. WOW...and thanks...I hardly remembered what it felt like to be pain-free!" Marion says her pain was 7/10 when she arrived at the pool today. It has kept her from walking, daily activities, and has caused a lot of discomfort. No position brought relief. This episode of back pain began about 3 weeks ago. The evening after her noon-hour session today, the pain is a 1 or a 2 / 10, with some stiffness (attributed to Connie's "thumbs of steel"). "It's as if the nerve pain never existed". "I have Degenerative Disc Disease, causing pain that can flare up suddenly. Usually, regular participation in Gentle Aquafit classes helps to manage this pain by strengthening core muscles and improving flexibility. But in a recent episode, with pain radiating from the SI joint, down the outside and front of my thigh as far as my knee, I started AquaStretch today and, for the first time in 3 weeks, there is significant pain relief. With exercises to supplement the benefits of the AquaStretch sessions, I am confident that I will be "back to normal" soon". As an AquaStretch™ Facilitator, I am also an AquaStretch™ client who has used this technique to alleviate the muscle pain and tightness which has resulted from hip surgery. I find it alleviates these conditions quite nicely. Moreover, a full AquaStretch™ session helps to open and awaken my senior's body and is easier to do than some of the land based self myo-fascial release techniques that I have worked with. “I was diagnosed with arthritis 3 years ago, in the neck, spine, hands and feet. It progressed very quickly and limited my mobility in a short period of time. Aqua-stretch has had a profound effect on me both physically and mentally. I experienced pain relief at the very first treatment. Aqua-stretch has increased my range of motion, and cut my consumption of painkillers by 95%. Thanks to you, I have also learned home techniques for stretching and pain management to help prolong the effects of the aqua-stretch treatment, and get back some of the activity I was used to do. This has given me a much healthier outlook on dealing with this, as well as being able to finally take a proactive approach to pain management. I can't thank you enough, Connie, for your on going care and support”. Jan S.
You and Laurie trained me in AquaStretch at IAFC. Since then I've been practicing and people are REALLY enjoying this! I worked on a client on Thursday who had walked up & down the hills of San Francisco and then taken a 10-hour flight home. He had horrible SI joint pain and some knots in the same side IT Band. He thought I was a miracle worker after our session. But that afternoon he overdid it working outside. He asked me ("begged") me to come back Friday. I found he had some pain in the same SI joint, but none in the IT band. After working on him I cautioned him to use ice and rest it. I gave him a handout with a few si joint stretches (land) and showed a few pool stretches that he can do once the pain is completely gone. Haven't heard from him today so assume he's fine. Thank you & Laurie for sharing AquaStretch with me!! Tell us about your AquaStretch™ experience.